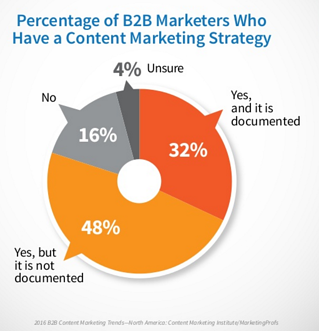 Its been shown time and again that B2B marketers who have a documented content strategy will be more successful than those that do not. In spite of this, a recent report from the Content Marketing Institute shows that fewer marketers are documenting their strategies this year than did in 2015 (32 percent vs. 35 percent). The challenge is figuring out how to document your content strategy. In today's post, we're going to dive into just that and look at seven ways that you can document your strategy to ensure that your campaigns will have the greatest chance to succeed. 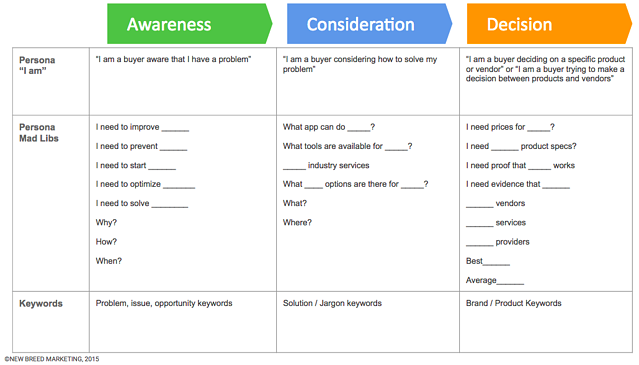 If you're looking for more information on how to create buyer personas, I highly recommend checking out this quant-based article from Price Intelligently, The Crucial Steps to Quantifying Your Customer Personas. You may have noticed that at this step specific keywords ideas are now being included, make sure to refer back to this as you are conducting your keyword research and creating your editorial calendar. Next, it's time to address your marketing goals and show how your campaign strategy will help your company be successful in reaching these. 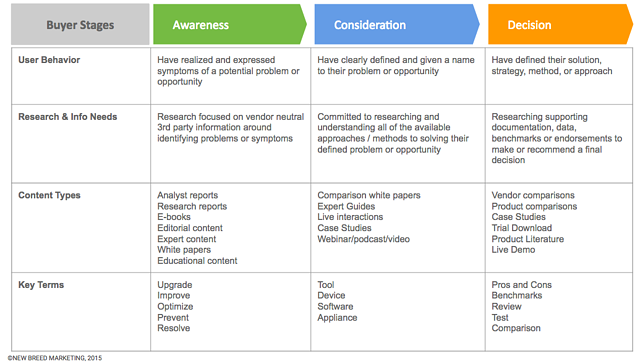 At New Breed, we look to track this through each stage of the funnel. 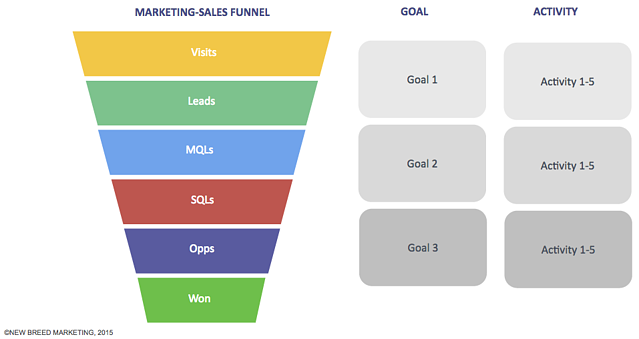 Working backward from your revenue goals, you can divide by your conversion rate at each stage to see exactly how many opportunities, SQLs, etc. that you'll need to generate with your efforts. With that in place, then document the goal you need to hit at each stage of the funnel and the activities that will contribute to that goal. With these goals and activities documented at a very high level, now move into the next level of granularity and define the key messages included in each campaign, and how they fit into any important product launches or broader trends in your space that you can capitalize. It's also a great time to look at any influencer marketing targets that may be able to support these efforts, as well as how this fits into your SEO program. 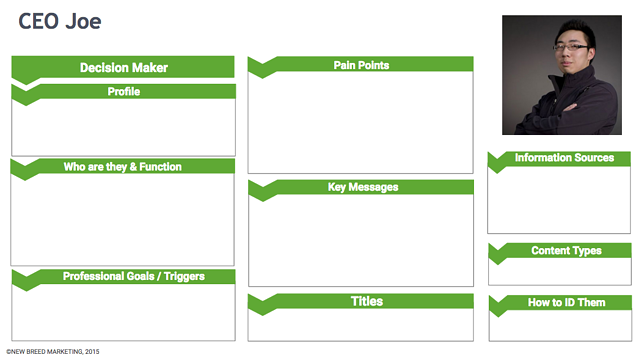 The final piece that's great to include in this are some simple productivity KPIs. For example, the number of blog posts and webinars that you'll need to complete on a monthly or quarterly basis. Finally, tie these disparate pieces together into the blogging editorial calendar that your team will be executing on. A thorough and accurate editorial calendar is a crucial content production management tool. Here's an example of what this might look like in Excel, many companies will also manage this process in Trello or a specific software program, such as GatherContent. Of course this careful planning is only the first stage of your inbound marketing process, but it has been proven one of the most important to ensure success so take the time to move through this process and document your plan at every stage. I know it can be exciting to jump right into keyword research or copywriting but you wouldn't put shingles on your roof before you've finished the foundation of the house. The same goes for your content strategy. 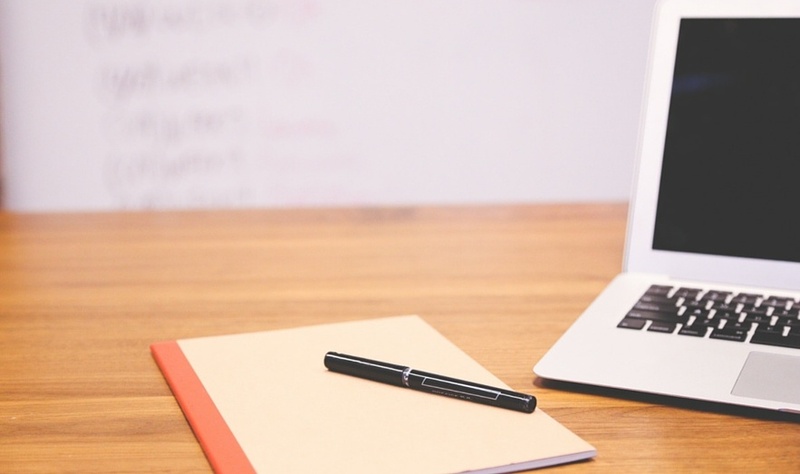 Is your business documenting its' content strategy? If so, what ways have you found to be most effective? Let us know in the comments below!